Dr. Grandhige was born in Washington, D.C. and was raised in Warner Robins, Georgia. After graduating from The Johns Hopkins University with a B.A. in Biology, he attended the University of Michigan – Ann Arbor to complete his medical school. In 1999, he secured a position in a general surgery residency at Yale University in New Haven, Connecticut. During his research years, he did a fellowship in Burn Surgery and Surgical Critical Care. He completed his general surgery residency and was selected to serve as the Educational Chief Resident during his final year in training. He continued at Yale University to complete a Minimally Invasive and Bariatric Surgery Fellowship. After his fellowship, he moved to Tampa, Florida in 2009. During his fellowship training, Dr. Grandhige gained expertise in his area of interest. He has special interest in the minimally invasive approach to the stomach. During his training he performed over 300 laparoscopic gastrointestinal procedures including many bariatric procedures. 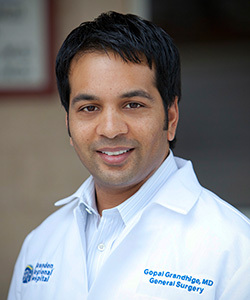 He specializes in the repair of hiatal, paraesophageal and diaphragmatic hernias, the surgical treatment of gastroesophageal reflux disease (GERD), specifically fundoplications and the laparoscopic management of achalasia. Dr. Grandhige also has significant experience in abdominal hernia repairs including ventral, umbilical, incisional, epigastric and inguinal hernia repairs. He performs both open and laparoscopic repairs of all complex hernias. In addition, Dr. Grandhige is experienced in the laparoscopic management of colon cancer and diverticular disease. The use of smaller incisions and minimal manipulation facilitates a quicker recovery in his patients. He also utilizes this approach for laparoscopic splenectomies and adrenalectomies. Dr. Grandhige routinely performs many laparoscopic cholecystectomies for the management of gallstones, gallbladder polyps and biliary dyskinesia. And along with this, he also performs laparoscopic appendectomies routinely. He is certified by the American Board of Surgery and is a member of SAGES (Society of American Gastrointestinal and Endoscopic Surgeons), The Yale Surgical Society and SLS (Society of Laparoendospic Surgeons).